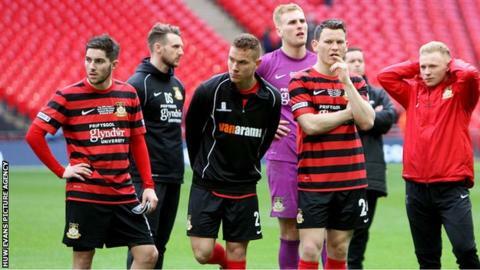 Wrexham coach Lee Jones criticised the players after their 1-1 draw against Aldershot on Tuesday. Jones has been assisting caretakers Carl Darlington and Michael Oakes run the team since the sacking of Kevin Wilkin in March. Wrexham are to hold talks with Gateshead boss Gary Mills, and Jones said the squad were "not good enough". "If I was a new manager looking at that I would say probably [only] one or two I would look to keep," he said. "I think whoever the new manager may be, he'll... probably want to bring in new players as well because over the past couple of seasons this current group have shown that they are not good enough. "We're a middle table team when we should be play-offs minimum." Wrexham are 10th in the Conference with one game remaining, at Telford on Saturday, 25 April. They were beaten in the final of the FA Trophy by Humberside village side North Ferriby United on penalties. Jones said the players could take no consolation from that Wembley appearance. "I don't think the FA Trophy was any big success even if we had have won it this year," said Jones. "It's been a really really disappointing season."